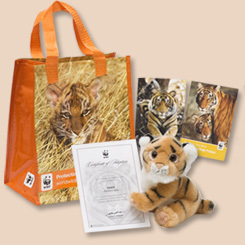 With your adoption you will receive a plush tiger (7") and matching tote (9-1/2" W x 6-3/4" D x 15-3/4" H). Reusable tote is made from 30-50% recycled material. Adoption kit also includes an adoption certificate, tiger photo and brochure. Many endangered species are killed to supply the illegal wildlife trade. World Wildlife Fund needs your support to protect habitats and stop poaching. Your gift of just $8 a month could mean the difference between survival and extinction for wildlife around the world. As a monthly donor you help us conserve paper by sending out fewer mailings. The support and commitment of monthly members are critical to our efforts to protect natural areas and the species that inhabit them. ...you’ll receive WWF’s online interactive magazine, with lively updates on WWF projects and photos that take you to the world’s most beautiful places. ...you’ll have full access to WWF’s in-depth website, worldwildlife.org, including your own secure member area. ...each fall we’ll send you an exclusive WWF wall calendar featuring spectacular photos of species and places where WWF works around the globe. ...you can enjoy the satisfaction of helping protect endangered wildlife and their habitats around the world. When will each monthly charge appear? Your charge will appear on your credit card statement monthly on the same day of the month that you make your original gift. What if I want to change the amount of my pledge? You can do so any time, or cancel your pledge if you wish, by logging into your secure member area on the WWF website, calling 1-800-960-0993 or emailing membership@wwfus.org. You will receive your free gift approximately six weeks after your first pledge is confirmed. As a monthly donor you help us save paper by sending out fewer mailings. View all member benefits. WWF is the world’s leading conservation organization, working in 100 countries for over half a century. With the support of 1.2 million members in the United States and 5 million members worldwide, WWF's mission is the conservation of nature. We are dedicated to preserving the diversity of life on Earth for the benefit of both people and wildlife. At WWF, 84 cents of every dollar raised go directly to our conservation programs. And while we're headquartered in Washington, D.C., our scientists and staff are hard at work around the globe, doing the critical fieldwork necessary to save threatened species and their habitats to ensure their survival. As a member of World Wildlife Fund, you are making a world of difference! Adopt a Tiger from World Wildlife Fund on Vimeo.